Split large file into smaller files and merge them together when you need it. 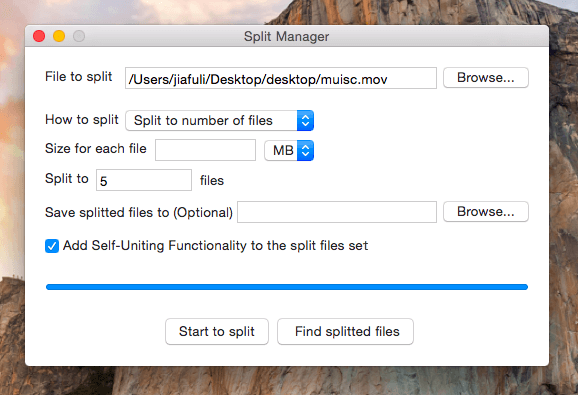 EasySplitMerge is a simple application that allows you to split a large file into smaller files that are more manageable, and merge them together when you need it. If you have a large file that cannot be sent to another computer, you can quickly and easily spilt this large file into several smaller files by using this software. And hence the files can be easily transferred to another computer. After which you can then use this software to merge the splitted files back as the original file. The application automatically splits the file according to specified file size and number of pieces. It supports any file type and there are no file format restrictions. File types supported include video, audio, documents, PDF, archive files, applications, spreadsheets, pictures, and so on. It has an intuitive interface and is easy to use. Also, it supports rapid immediate split and merge/restore files without waiting. EasySplitMerge also generates a small Self-Uniting program, So anyone can restore the original file easily without EasySplitMerge having to be installed on the destination system. Softknoll PST to Mbox converter tool - Which export entire Outlook PST like attachments, tasks, contacts, journals, notes, and calendars etc. DataHelp OLM to Office 365 migration tool to migrate OLM data to Office 365 user account. The tool will export entire data items emails, contact, calendars, tasks, etc to Office 365 without any type of data loss.